If I were to hand you an orange, what would you do, assuming that you like oranges? You'd first peel the orange, toss the peel then eat the juicy insides. 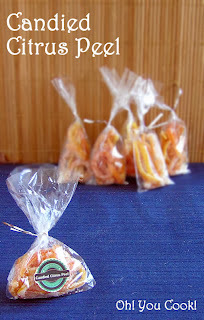 Candied orange peels have you do the opposite: eat the peel and toss the insides. Scroll down and read the instructions ... you will notice that I leave the pith attached. "Wait!" you say, horrified! "Won't that make for a bitter candy?" In a word, no. All that blanching removes any trace of bitterness. Leaving the pith on allows the candy to be a little thicker and plumper. Plus you save oodles of time not having to scrape off pith that stubbornly adheres to the peel, even when using a veggie peeler to lightly shave the fruit, which I don't use here anyway because I usually wind up shaving off some of my skin in the process. A sharp knife, used properly, makes straighter cuts and gives you more professional-looking results as a bonus. 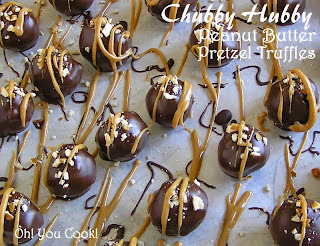 Where else can you find a candy that can almost double as a healthy meal? Pretzels ... umm ... good source of wheat? Aside from the deliciousness of the ingredients, I was first attracted to this truffle by the cool truth-in-advertising name. Avoid sampling if you want to give as gifts, otherwise absolutely none of it will make it into baskets. Speaking of gifts, the peanut butter garnish is very soft, so you might want to either omit it, or package them with plenty of headspace. Or just save them for serving at home. They are really too good to share, anyway.